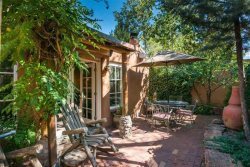 In the heart of Santa Fe, this authentic adobe home was built in 1898. Gorgeously remodeled, it has multiple features sure to please the most meticulous guests! The master suite is large with its own private patio with an outdoor fireplace! Multiple places to relax and sleep are a plus for large groups! The open-concept kitchen is ideal for gatherings! The rooftop deck above the garage is a must in the early mornings or late evenings or for a little yoga! Experience Santa Fe in style. This is an incredible property! The owner has been very meticulous in his renovation! The home is gorgeous with ample space for everyone to enjoy. The courtyard is a true oasis! And the rooftop deck is such an added bonus to this property! Don't miss out on this one! You will have access to the entire home, courtyards, garage, and roof-top deck! I am only a phone call away, but I'm happy to meet with my guests if they desire! The Driveway is shared with guests that stay in the casita. Both the main home and the guest home have their own courtyards and private entrances. This home also includes the rooftop deck. Though it is ideal for large groups and families, we ask that children be supervised and please no climbing on any indoor or outdoor furniture, especially with shoes on. Also, the courtyard is professional landscaped and features walking paths, vegetation, and pebbles. Please be mindful as not to disturb the grounds. Some spaces are shared - The driveway to the garage is shared, however, guests may also park one car in the garage.